Ever see the slicers at your favorite deli counter and wish you had that same precision and convenience at home? 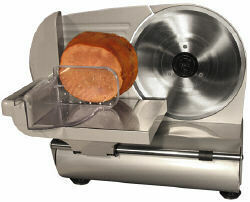 Now you can with this Weston Meat Slicer! The Weston Brand Heavy Duty 9" Food Slicer features a rugged, quiet running motor and a high quality removable stainless steel blade allowing you to slice through all of your meat, cheese, bread, and vegetables quickly, safely, and easily! Dimensions: 14.3 x 19.3 x 12.3"